Mott has had some tussles over the years on the road against Delta College (8-12). It’s rarely been easy for the Bears in Pioneer country, but they always seem to come away with a win. A similar storyline played out Wednesday night, albeit with even more drama. The Bears overcame a 4-point deficit in the final 90 seconds to hold on to win, 63-62. After sophomore Malik Albert made a pair of free throws, Delta had the ball and a chance to win the game with 11 seconds left in regulation. The Pioneers’ Caleb McIntosh failed to convert and Mott’s Myles Busby swept away the rebound to secure the win. At one point midway through the second half, the Bears were down nine points and in danger of frittering away any chance of winning the MCCAA’s Eastern Conference. They fought back to tie the game with four minutes to go, but trailed by four in the final 90 seconds before Albert, the frontrunner for Player of the Year in the MCCAA, went on a 5-0 run by himself to put Mott up one. Mott played with a sense of urgency in the final two minutes, holding the Pioneers scoreless. Tre Johnson led all scorers for Delta with 24 points. 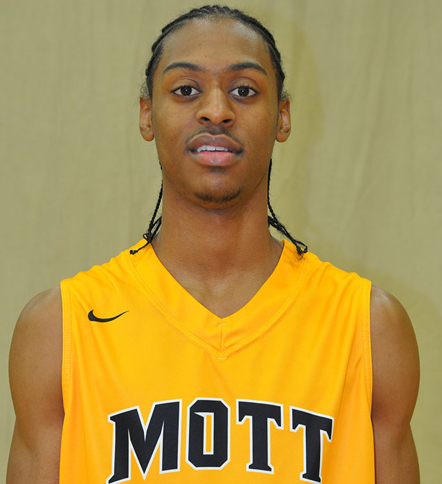 Albert had 15 points for Mott (16-4), 10 below his average. Ruston Hayward and Marcus Johnson, both freshmen, added 12 points apiece. Tre Johnson led Delta with 24. The Bears should have another chance to redeem themselves from their most recent uninspiring trip to Delta, as the Pioneers will host the district tournament in March. Mott returns to action at 3 p.m. Saturday at home versus Henry Ford. Listen live on MRSN.us. FLINT, Michigan — Mott Community College won its third consecutive game on Saturday afternoon, but the Bears didn’t look good doing it. Mott (15-4) managed only 23 points in the second half, while still easily putting away hapless Alpena, 69-45. Mott led by 22 at the half after struggling through the game’s first 10 minutes. Alpena actually had a lead, 14-13, midway through the first half. 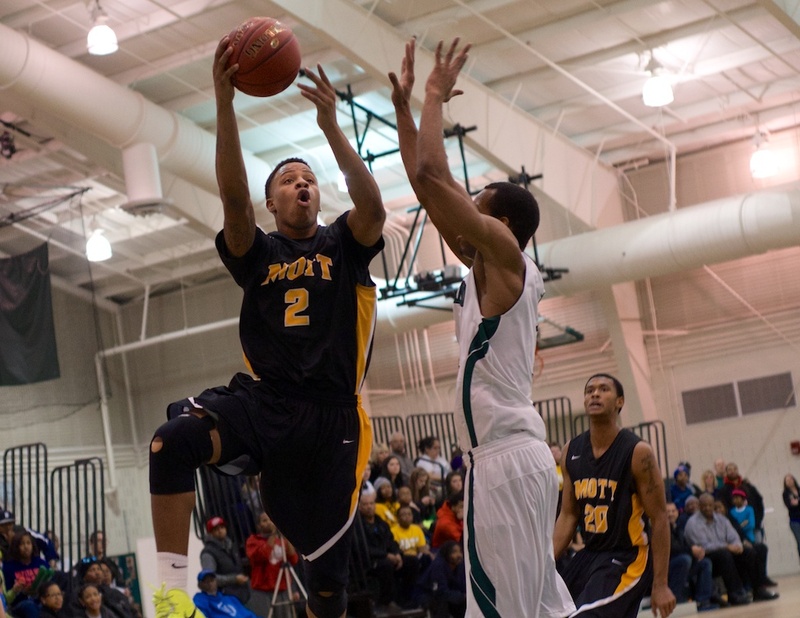 Fortunately for Mott, sophomore Malik Albert was simply unstoppable. Albert led all scorers with 32 points on only 18 shots. It’s strange to think any team could “win ugly” by 24 points, but that’s exactly what happened. As a team, Mott only tallied 10 assists to 15 turnovers. That’s bad, certainly, but it actually compares favorably to Alpena’s almost impossible 1-to-12 assist-to-turnover ratio (2 assists, 24 turnovers). Mott made only five field goals in the second half, but the game was already well in hand. The team’s struggles are due, in large part, to its inability to finish on the break — something like I’ve never been able to say about a Mott team. It didn’t help that starting guard Devin Foster, one of Mott’s most talented players, had five more fouls than he did points. Freshman Marcus Johnson was the only other bright spot for Mott on Saturday, scoring 17 points with two assists. Kharri Dailey and Stephen Shepherd led Alpena (4-12) with 11 points apiece. The Bears will have to get it together, and fast, as the meat of the schedule approaches. Mott will face Delta on the road at 7 p.m. Wednesday night before playing Henry Ford (home), St. Clair (away), Wayne (home) and Oakland (home) in four of the next five games. Those games are all winnable, and losable. Mott Community College earned its second win in three days, knocking off Schoolcraft College (10-7) Wednesday night, 84-62. The Bears turned in a strong night of work defensively, forcing the Ocelots into 28 turnovers. Sophomore guard Malik Albert led the Bears with 22 points. Freshman guard Marcus Johnson chipped in with 17. Sophomore transfer Jamal Reynolds, probably the biggest bright spot for the Bears this season, continued his strong play with 11 points and seven rebounds. Despite being in foul trouble for much of the game, Mott freshman Ruston Hayward, in his second game back since knee surgery, scored 12 points with four rebounds and four assists. Mott (14-4) returns to action at 3 p.m. Saturday at home versus Alpena. Mott (13-4) had a much-needed respite Monday night after a demoralizing double overtime loss to Oakland on the road Saturday. The Bears welcomed Kirtland into the friendly confines of Ballenger Field House, and quickly dispensed with the niceties. The Bears led by 20 at the half and cruised to victory, 92-53. Freshman guard Marcus Johnson led Mott with 19 points and eight assists. Sophomore Jamal Reynolds turned in another strong performance with 19 points and 14 rebounds. Freshman forward Ruston Hayward, in only his second game back from knee surgery, returned to the starting lineup and poured in 16 points with five assists. “Ruston gives us an offensive presence and a toughness that has been missing from this team,” said Mott head coach Steve Schmidt. 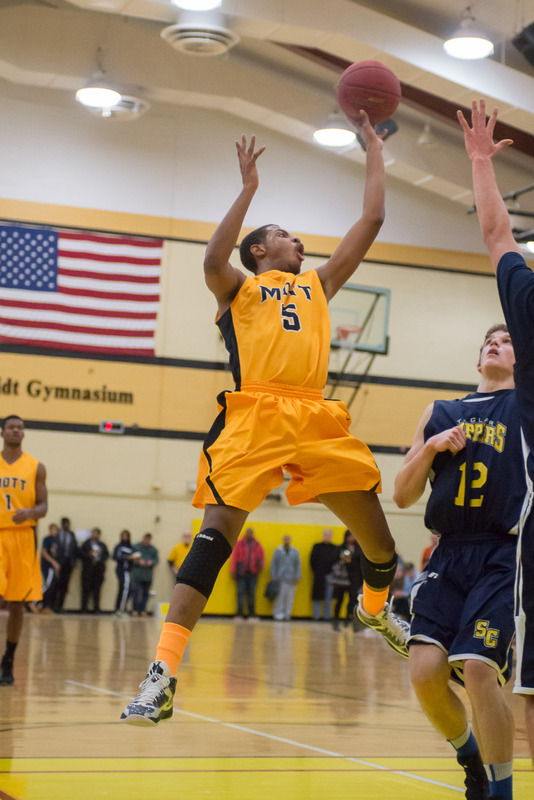 Sophomore guard Malik Albert, Mott’s leading scorer, finished with 13 points. Mott’s William Abbott did not play against Kirtland. The 6-7 redshirt freshman has been suspended after violating a team rule. There is no word on a timetable for return. Mott will be back in action Wednesday night on the road at Schoolcraft (10-6). The game tips at 7:30 p.m.
Mott freshman Ruston Hayward scored 11 points against Oakland Saturday in his first game back since suffering a knee injury. AUBURN HILLS, Michigan — No. 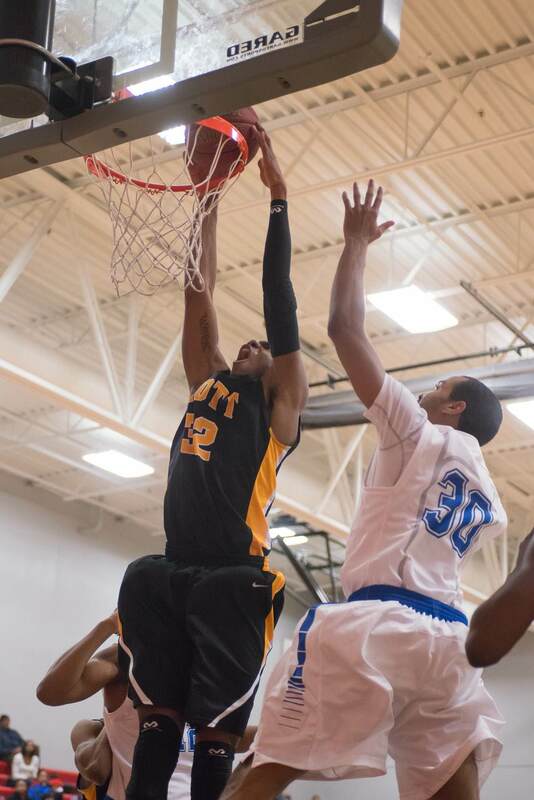 9-ranked Mott had two chances to snap Oakland CC’s 10-game winning streak on Saturday. The Bears failed in both endeavors and finally succumbed to the Raiders in the second overtime, 111-105. Trailing by three at the half, Mott took its first lead of the half at the 16-minute mark. Mott extended its lead to seven at the 11-minute mark, but frittered it away just two minutes later. All told, there were more than a dozen ties or lead changes in the second half alone. With 10 seconds remaining in regulation, Mott had the ball with a chance to win the game. Chester McFadden, a sophomore guard, missed a contested 3-pointer to send the game to overtime. In the first overtime, Mott had another prime opportunity to win the game. With five seconds to go, Mott freshman Lorenzo Collier hit the first of two free throws to put the Bears up two. After missing the second, Travontis Richardson got the rebound and hit Richard Roberts on an unchecked outlet for an easy lay-up to send the game into double overtime. McFadden, at midcourt, looked like an outfielder watching a home run ball. FLINT, Michigan — With Mott coming off a tough loss against Wayne on Saturday, Wednesday night’s game versus St. Clair loomed large. Just last week, the Skippers played two of the top teams in the state (Oakland and Wayne) tooth and nail, but finished out a hellish stretch in their schedule with a 92-78 loss to no. 9-ranked Mott. With Mott’s top scorer, Malik Albert, on the bench to start the game (punishment for showing up late to practice), sophomore guard Devin Foster slid over to the driver’s seat and led Mott to a 20-point lead early. Foster scored nine points in the first five minutes and put the Bears in a position to blow out the Skippers. For more than a 10-minute stretch of the first half, the Bears couldn’t miss. Mott stalled out late in the first half to lead by “only” 15 points at the break in a game that felt like a runaway. Even after snapping the hot streak, the Bears shot nearly 60 percent from the field in the half. Mott started the toughest stretch of the 2014 schedule this afternoon in downtown Detroit, falling to Wayne County CC, 85-73. It was the Bears’ second consecutive loss on the road to Wayne. The Bears (11-3) led by five at the half but surrendered 50 points in the second half. Malik Albert and Marcus Johnson scored 20 apiece for Mott. Devin Foster and Jamal Reynolds added 12 and 11 points, respectively. Albert, Mott’s leading scorer, played big minutes in the first half and scored only one basket and four points in the second half. “We depend on Malik a lot, but he just didn’t have the energy in the second half,” Schmidt said. Redshirt freshman William Abbott, a Detroit native, scored only four points in the game after three consecutive strong outings. Mott fell victim to a quick whistle in the first half, and the trend continued throughout the game. Mott was whistled for 30 fouls in the game. Wayne (17 fouls) entered the bonus in the game’s first five minutes. Shaun Duncan led Wayne (9-2) with 20 points. The Wildcats have now won six consecutive games. Mott will return to action at 7:30 p.m. Wednesday versus St. Clair. FLINT, Michigan — Mott will enter Saturday’s big game in Detroit versus Wayne on the heels of its best defensive performance of the season Wednesday night. The Bears held Macomb to 14 points in the first half en route to a 78-39 home victory. The only thing colder than the temperature outside Ballenger Field House was the perimeter shooting of Macomb. The Bears held the Monarchs to an atrocious 5-for-24 from the field in the first half. The only factor that kept this game from getting way out of hand was Mott’s inability to convert around the basket in the first half. Mott sophomore Chester McFadden led all scorers with 15 points. Freshman guard Marcus Johnson scored 14 points with five assists. Sophomore guard Malik Albert entered the game leading the nation in scoring, but finished with his lowest point total of the season: 10 points with seven assists. Redshirt freshman William Abbott continued his strong play, scoring eight points with 12 rebounds in only 18 minutes. Brandon Hicks led Macomb with 14 points. Hicks had two of the team’s three total assists. Mott’s game on the road Saturday versus Wayne will tip at 3 p.m. This is a huge game for Mott, as Wayne is one of the top teams in the MCCAA this season. Despite having classes canceled for the last three days, no. 6-ranked Mott will still host Macomb Community College Wednesday night. The game will tip at 7:30 p.m. at the Steve Schmidt Gymnasium in Flint. Mott is 10-2 on the season. If you can’t make it out, listen live at MRSN.us. Leaving Dearborn with a win hasn’t been so simple for Mott over the last five or six seasons. Henry Ford Community College, under head coach Abe Mashour, has been the Bears’ chief rival during the program’s rise to prominence. On Saturday afternoon, Mott took on a Henry Ford squad that’s a little less talented than normal, but still unwilling to lay down for a better team. The no. 7-ranked Bears led by seven at the half before pulling away to earn an 82-66 win. Every passing week, more and more teams are saying the same thing about Mott guard Malik Albert. The 6-2 sophomore poured in 37 points on 19 shots. Six missed free throws cost him a chance to reach the 40-point mark for the third time this season.